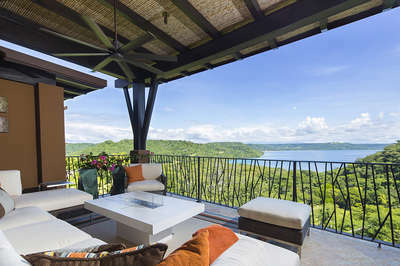 Within the lush grounds of the Peninsula Papagayo in Costa Rica, Villa Manzu is a completely private sanctuary of its own. This eight-suite estate - at just over 30,000 square feet- sits on five acres in an isolated peninsula and offers plenty of room to spread out, from the two swimming pools and spa to the theater room and expansive bar/party room. The grounds are dotted with hammocks, chairs and restful areas, perfect for quiet moments taking in 180-degree sea views and watching monkeys cavort in the trees. This is definitely not your typical private villa experience. The staff is highly trained as well as educated in the Costa Rica history and surroundings; who also serve as guides and entertainment for the guests, greatly enriching the experience. Included with the Villa is breakfast, lunch, and dinner prepared by amazing chefs; a wine room stocked with hand-picked wines and award-winning cigars; a butler and maid services; and a concierge to help enrich your stay. The Villa drivers will wisk you around Costa Rica in a Range Rover, Ford Explorer SUV, or Jeep Wrangler. Your adventure starts in the Villa Manzu garage; stocked with two golf carts, a dozen surfboards and stand up paddle boards, two kayaks, and three mountain bikes. The Arnold Palmer golf course, tennis courts, and marina are minutes away. Many hiking paths lead from the Villa to the several nearby beaches with the closest only being 100 yards away. Nestled along the palm-fringed sands of the Peninsula's most coveted cove is Playa Prieta and the 38,000 sqft Beach Club where you can drift away the afternoon under the Pochote trees and the sounds of the ocean.